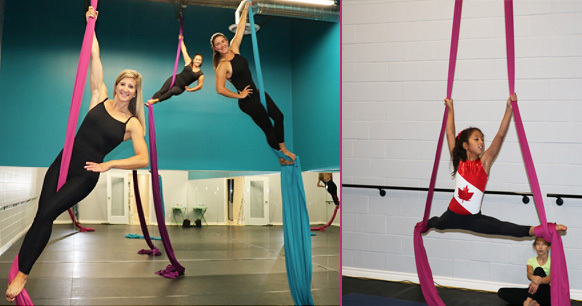 Aerial silks is a beautiful combination of circus and dance that will improve your flexibility, strength, coordination and confidence with a weekly class. No experience necessary! With brand new state of the art equipment, and our professional and qualified staff you'll get the chance to fly in the air! Production Silks April 9 - May 23 - this class will participate in the Year End Recital. New students have a reg fee of $25 applied to their first payment. Please see our fees page for more information. Please call studio for level placement recommendations.